"Postcards" has been released! It's a collection of piano-driven instrumentals, with a light symphonic orchestration, consisting of soft strings and melodic flute. It fit's well into Neo-Classical, New-Age and Contemporary Instrumental playlists, so it's great to relax to. The album is available to stream in full on my website and to receive a FREE MP3 of my favorite album track, please sign up to my 'new album' email list. You'll get another free track when the next album is released. If you like what you hear and wish to purchase the album, please consider picking it up from my preferred web distributor, as you'll be supporting my future work to the fullest. The cover image is of Gold Hill in Shaftesbury, England. I took the photo on a visit with family and was struck by the timeless beauty of the street that Hollywood Director, Ridley Scott, made famous. My debut release "Ethereal" has passed the submission process for Pandora Internet Radio and my artist station page is now live, here and in the permanent footer link 'Pandora' button below. For anyone who doesn't know what Pandora is, it's the most popular internet radio service in the US, Australia, New Zealand. I must also say that since learning about how Pandora works, I've become a massive advocate and I recommend it to everyone. I often listen to the 'New Age Solo Piano' station while I do a bit of housework (chuckle). The 'music genome' process works so well and it seems superbly fair in focusing solely on the musical qualities over all over factors! How totally refreshing, unique and exciting! It's fabulous to hear artist Yiruma, followed by Film Composer Aaron Zigman, followed by a new artist I hadn't discovered yet. When you create stations (sort of like playlists) they acts as launchpads for similar music. It's little wonder that Pandora has become number one for internet radio, comes pre-installed in Blu-ray players, streaming devices and cars etc. "Each track is analyzed in the Music Genome Project using up to 450 distinct attributes before it plays on Pandora. This deeper review process does take time to ensure we are capturing the identity and qualities of each track that are relevant to the preferences of our listeners." 'Ethereal' went live and began playing on September 7th, 2016, so the whole process took 41 days from start to finish (in my case). The artwork might take a week or two longer to update in their system and I am waiting for Rovi to add biographical information and my artist photo (they supply this info to most streaming databases, including AllMusic. 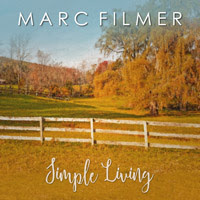 To start things off, we'll play a song that exemplifies the musical style of Marc Filmer which features new age aesthetics, an overall meditative sound, acoustic sonority, extended vamping and major key tonality. According to Pandora, similar artists are: Richard Dillon, Toni Verde, Christine Bustos, Clint Mansell & Kronos Quartet and Laura McMillan. My debut Album "Ethereal" has been digitally released and is available now for purchase on itunes, amazon mp3 and google play. The tracks can also be streamed via spotify and iheart radio and in the coming weeks, I'll be releasing some music videos on YouTube featuring a 'player piano' style view. It's my hope that these videos will make for a relaxing viewing experience and also be useful to anyone wishing to actually play the tracks themselves on piano.